Charm City Traveler: Another JetBlue One-Day Mega Sale! 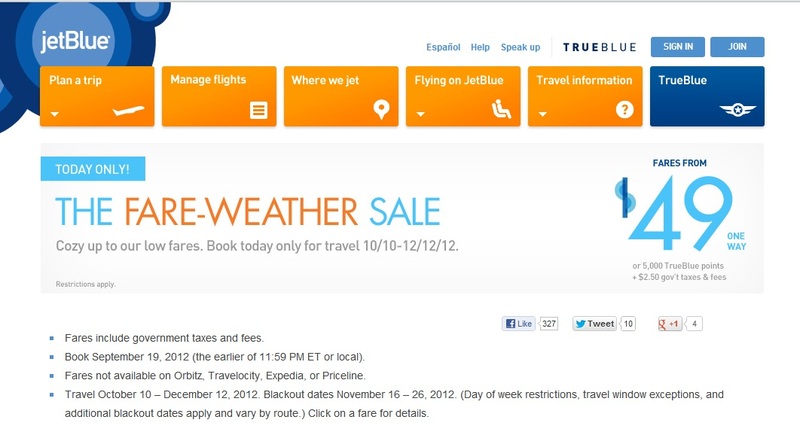 One of my more popular posts of all time centered around a JetBlue one-day flash sale back in August. The deals were truly incredible, and it looks like they are back at it once again. 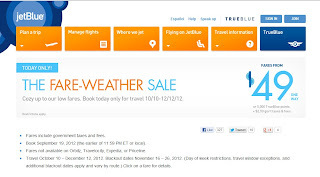 JetBlue is holding another sale through most of its cities through MIDNIGHT TONIGHT (September 19). Though folks residing in the New York and Boston area will probably get the most value out of this, there are still great deals to be had. I noticed a Fort Lauderdale to San Francisco round trip for only $238! Wow! You can click on this link to see the deals between all city pairs. Fine print details of the promotion are below, but again, you have until midnight tonight to book, so get moving! Fares not available on Orbitz, Travelocity, Expedia, or Priceline. Travel October 10-December 12, 2012. Blackout dates are November 16-26, 2012.